DURING THE RESTORATION THE MAJOR PART OF THE CHURCHYARD IS OPEN TO ALL. UNFORTUNATELY HEALTH AND SAFETY INSTRUCTIONS MEAN THAT THE ORANGE NETTING INDICATES WHERE PUBLIC ACCESS IS RESTRICTED. IF YOU WISH TO PLACE FLOWERS ON A GRAVE IN THE RESTRICTED AREA, THIS NEEDS TO BE DONE WITH THE PERMISSION OF THE CONTRACTOR WHEN HE IS ON SITE OR AT YOUR OWN RISK WHEN HE IS NOT. WE KNOW THAT ACCESS TO FAMILY GRAVES IS VERY IMPORTANT - ESPECIALLY AT THIS TIME OF YEAR AND WE HAVE DONE WHAT WE CAN TO MAKE THIS POSSIBLE. THE SCAFFOLD BUILD HAS CAUSED SOME DISRUPTION, BUT THE WORST IS NOW OVER. WE WILL DO WHAT WE CAN TO MAKE GOOD ANY PROBLEMS CAUSED BY THE SCAFFOLD BUILD AND APOLOGISE FOR ANY INCONVENIENCE. 18/11/18 Looking East - What a lot of scaffold poles! 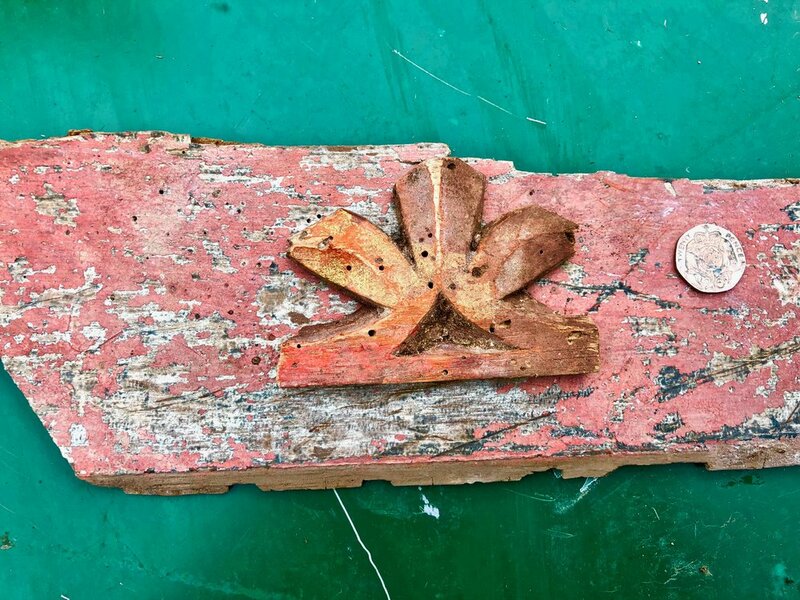 Some interesting artefacts have been found in the ancient roof space including a small painted wooden piece and decorative carved trefoil thought to be from a rood screen dating from the 14th or 15th century! There was also a wooden plank cut with an axe with the name of the Victorian master builder carved on it in c1860. He was John Westlake of 79 Fore Street, Camelford. 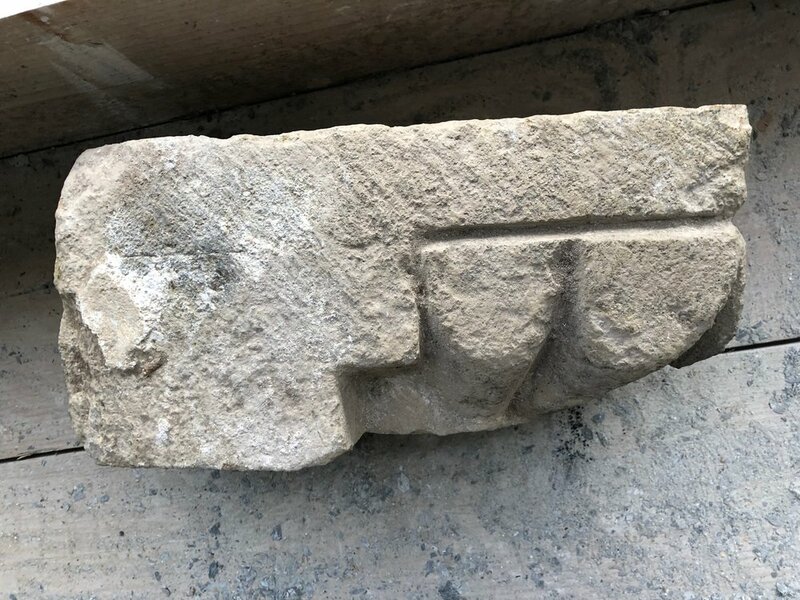 Also an early carved capital that was found filling a gap in the south aisle wall. IT is thought that it could be from an earlier church and dated around 1150 AD. It was thought to be at the top of a door pillar for the door arch to rest on. Scroll down to see most recent photos and info. This page aims to keep up with the progress of the restoration process and the ups and downs that there will inevitably be. Although we have the majority of the necessary funds we are still short by approx £50,000 - so some compromise will have to be made unless we can find the extra. Can you help? Click here! The scaffold company worked on the Methodist Church Restoration in Camelford and were praised for their excellent scaffold design. This is going to be needed here as the covered roof will have a very large span. 20/12/2018 The protective lid goes on.. Eleven men working on site in between downpours. 30/1/19 Wow! Where has the tower gone? 15/16th century decorative wood - probably from a screen - with original paint - 500 years old! Unfortunately the roof timbers have been found to be in much worse condition that was originally thought during the opening up inspection. The medieval oak rafters are so rotten in places that they have disappeared although the wood that remains is as hard as rock. The Victorian restoration 150 years ago used rather light weight pinewood and extensive supportive A frames and tethering are required at a significant extra cost. The ancient wood in the roof is due to be dendron dated to check exactly how old the rafters are. Sadly the extra cost of strengthening the roof of the whole building is £50,000. HELP!